Belle, the latest OS upgrade for what used to be called Symbian phones, was released yesterday in most markets for the C6-01, C7, E6, E7, N8, X7 and Oro. 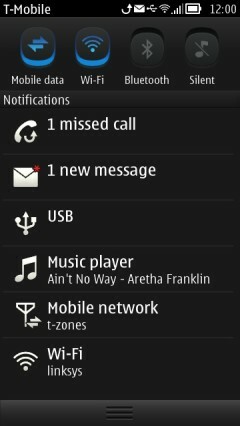 Update: Belle for the Nokia 500 was released Feb 15.) I was pleasantly surprised to see that updates for US phones were available on the first day of the rollout. This is a welcome change from the Anna release which came to North America months after it was available in most countries. As of today it looks like Belle is available in most of the world for most devices and product codes. Notable exceptions include Canada, Australia and Israel where Belle isn’t available for any variant yet. Nokia has a Web page where you can check availability by country and product code. The Belle update can’t be installed directly to the phone over the air. A PC is required. Hopefully this will change for the millions on mobile users without a PC. I run Ubuntu Linux on my PC so I had to fire up my dusty old Windows PC to get it. I’d always used the lean and mean Nokia Software Updater (NSU) for phone updates but when I fired it up I got a message saying “You must use Nokia Suite 3.3 or later to update your N8.” So I launched Nokia Suite which seemed to run better than I remember and did the update in about 30 minutes unattended. Heed the warning to backup your phone! The Belle update didn’t preserve very much of my existing data. I lost every app that I had installed, including ones installed on the E: drive. I also lost all my Notes. At least photos, contacts, saved text messages and browser bookmarks survived the upgrade. Belle looks and feels a little like Android with a redesigned status/notification bar at the top of the screen (image above, left). Icons appear in the bar to notify you of new texts, missed calls and updates for preinstalled apps. 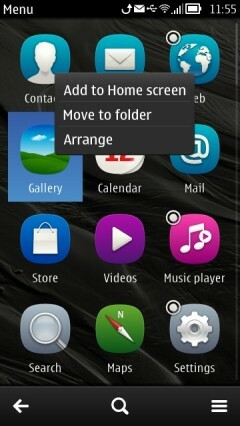 Just like with Android you can drag the bar down to reveal a “drawer” with widgets that let you act on alerts. There are also widgets that let you adjust Bluetooth, WiFi and USB settings (image above, right) as well as handy buttons for toggling Mobile Data, WiFi, Bluetooth and the Silent profile. 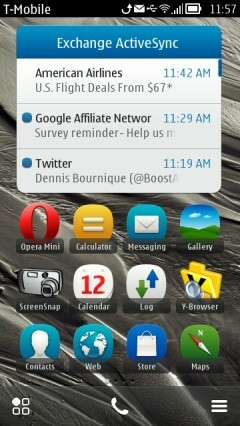 I’m rather disappointed that there is no email notification icon for the status bar. As before, the only notification of new incoming email is an alert tone. As far as I know there isn’t any way for third party apps like Twitter clients to add notifications to the status bar either. 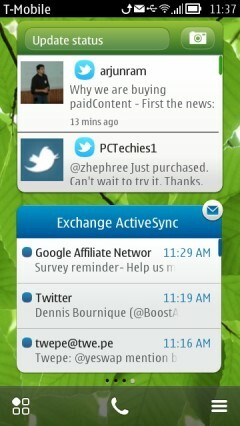 Swiping between home screens is smooth and seems instantaneous. That annoying minute long hang after installing or uninstalling an app is gone. 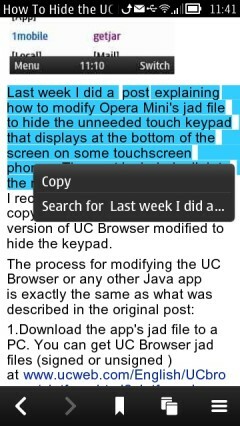 The Swype keyboard is a little less laggy, although it could stand some more improvident. There’s improved memory management that’s supposed to reduce the frequency of out of memory errors. The Nokia keyboard has larger, better spaced keys. The browser finally supports copying text from a page (image above, left). Up to six home screens are supported. Widgets are no longer limited to taking up the full width of the screen and come in many sizes. Application shortcuts can now be added one by one instead of in groups of four. They can now be added directly from the main application list (image above right) as well as by long pressing on a home screen (image below, left). The new Email and Social widgets (image below, right) are scrollable and much larger, allowing them to show more and longer summaries of Emails, Tweets and status updates. There’s a lot more that’s new in Belle including new Camera and Browser user interfaces. All About Symbian, as usual, has a very comprehensive piece on Belle that includes a full change log. There are supposed to be some browser performance improvements as well. I’m planning to write a post covering the browser in depth, including benchmarks and site compatibility testing. This entry was posted in Nokia and tagged Belle, Symbian by Dennis Bournique. Bookmark the permalink. @yogesh: is depent on your needs. If you need a phone dont buy android phone.Nokia is a best product for phone.As I used a lot of smartphone product,finally I come back to Nokia.You only play games within 2 to 8 months after you buy a mobile phone.But what actualy you need everyday is the phone feature,messaging,dictionary,maps,calculator,chat and phonebook management.So for that,nokia is the best in personalising the feature. If you dont believe me,please look at people with iphone,android,etc.mention what they used their phone for,or even ask them. and one thing you should consider is,the tough body build by nokia and battery performance.The big processore out there with 1 up ghz speed is not useful for a phone feature instead just drain the battery performance. So for phone, NOKIA is the best.Try it. If you want games,work,etc,go get some tablet or notebook or even PS Vita. 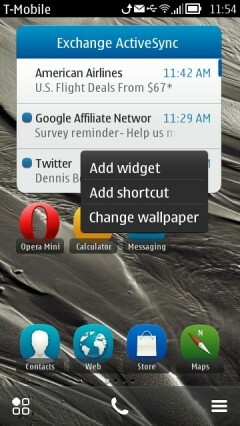 Could please assist me should i go with N8 / E7 or android? Nokia says Belle for the 500 is coming soon. No date yet. i am very happy with my n8 and the new belle, but in this case “Swiping between home screens is smooth and seems instantaneous” i can’t agree…any idea why it looks not so smooth? Not really. For me, there’s just a slight delay before it starts to move and then it slides to the next screen in one continuous move. If you’re seeing something else it might be related to the particular widgets you have installed or what’s running in the background.